A trendy invitation for your child's First Communion. 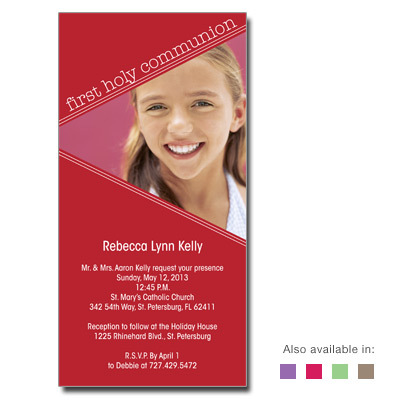 Pick from your favorite color from red, brown, mint green, pink or purple, with your first communion information in white text. Perfect for a boy or a girl, this skinny invite with a triangle frame for your favorite photo is the perfect way to highlight the event. Card measures 3.5x7 inches and comes with matching envelopes.